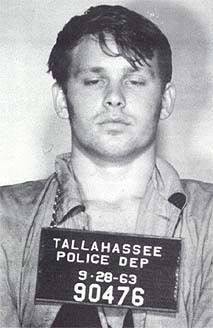 Here’s a weird one: weirdo Doors frontman Jim Morrison, native of Florida, the weirdest state in the Union (well, it is! ), stars in a promo film for Florida State University. Morrison’s character gets a bummer of a letter informing him that he has been rejected from FSU, and later meets with an administrator who gives him the lowdown. Of course, as one YouTube commenter quips, “when one door closes, The Doors open” (heh). So, fine, Morrison didn’t need Florida State---he lived fast, died young, and left the most famous grave in history. He hung around with a bohemian crowd: people who liked to wear pants with holes in them. Jim posed as a model for the art department, and they would all sell blood to the Red Cross to get a few bucks. Once, I saw Jim go around the college coffee shop eating scraps off tables. I felt he--and the others--were living an image--the starving young artist. But Morrison wasn't exactly a starving artist. He was, in fact, the son of Rear Admiral George Stephen Morrison, commander of the U.S. Naval forces in the incident that sparked the Vietnam War. Weird, right? Watch the elder Morrison and Jim’s sister Anne in interview remembrances of Jim in the video below. Impressive! I love reading news that isn’t anywhere else! “My eyes have seen you”…. Like it or not he was an a weirdo with NO TALENT AT ALL.So why would anyone romanticize him?I’m not joking,why would they?